Based on Western Digital 64-layer 3D NAND, the SanDisk® X600 3D NAND SATA SSD delivers high performance, high capacity, and superior endurance. In capacities of up to 2TB, the X600 3D NAND SATA SSD achieves this while expending up to 25% less power than our previous generations of SATA SSDs. The X600 3D NAND SATA SSD combines Western Digital’s state-of-the-art 64-layer 3D NAND technology with our proven SSD platform. It also incorporates nCache™ 2.0, a tiered caching technology designed to improve responsiveness for corporate and consumer workloads. nCache 2.0 uses a combination of both SLC (single level cell) and TLC flash blocks to improve endurance, increase efficiency, and boost performance. Writing data first to the SLC cache reduces write amplification on the TLC blocks. It features Device Sleep (DEVSLP), more frequent use of low-power modes, and faster transitions between various power modes. Also included for superior error recovery, DataGuard™ Client provides a robust on-the-fly error handling technology. With a variety of design and integration options for manufacturers and systems builders, the X600 3D NAND SATA SSD is available in either an SATA 2.5"/7mm cased or an M.2 2280 form factor, with capacities of 128 gigabytes2 (GB), 256GB, 512GB, 1 terabyte2 (TB), and 2 terabyte2 (TB). 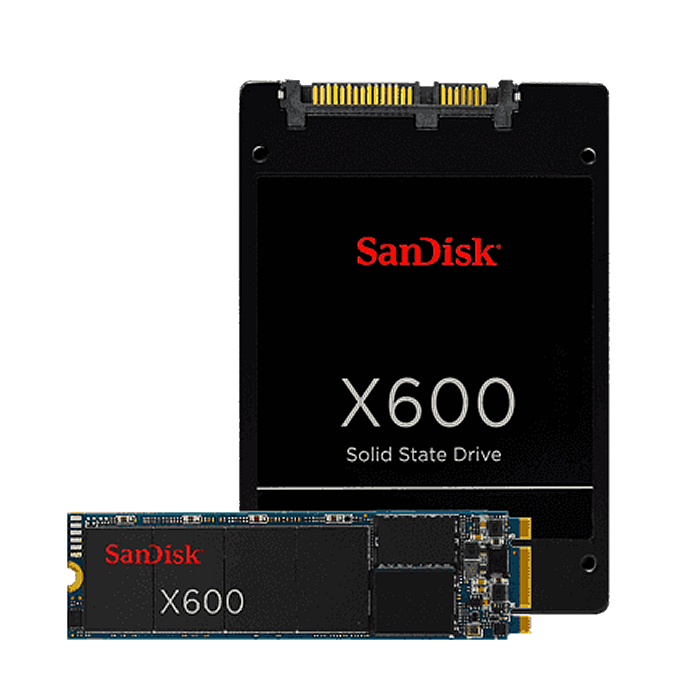 The SanDisk X600 3D NAND SATA SSD uses Western Digital 3D NAND technology not only for higher capacities (up to 2TB1) than the previous generation of SanDisk X400 SSDs, but also to help reduce cell-to-cell interference for enhanced reliability. With 1.75M hours MTTF (mean time to failure),4 up to 500 TBW (terabytes written), 5 and several error correction technologies, SanDisk X600 3D NAND SATA SSDs can help guard data for years to come. Featuring an active power draw of up to 25% lower2 than previous generations of SanDisk X400 SSDs means you’re able to work longer on-the-go before recharging your laptop. 1. As used for storage capacity, one terabyte (TB) = one trillion bytes. Total accessible capacity varies depending on operating environment. 2. Active power draws are up to 25% lower during sequential reads than previous generations of SanDisk X400 SSD at the 512GB capacity point. 3. As used for transfer rate or interface, megabyte per second (MB/s) = one million bytes per second and gigabit per second (Gb/s) = one billion bits per second. 4. MTTF = Mean Time To Failure based on internal testing using Telcordia stress part testing. 5. TBW (terabytes written) values calculated using JEDEC client workload (JESD219) and vary by product capacity. 6. imensions and weight vary based on form factor and capacity.